I get bored with chicken and am always looking for ways to “snazz” it up. 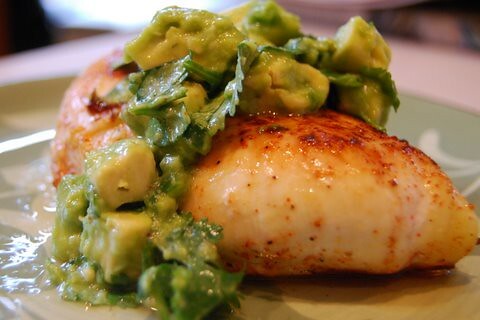 However, I never get bored with avocado and pretty much ANYTHING with avocado is a winner in my book, including this gem of a recipe – Seared Chicken with Avocado. As I say with every recipe I share, go ahead and add these items to your grocery list for the week and promise me that you will make this sometime soon. You will love it. Would I ever lie to you? And when you do and you fall off your chair because it is so good, then you can come back here and leave me a comment about how great I am to share these with you. Add chicken; cook 1 minute or until seared. Reduce heat to medium; cook 3 minutes on each side or until done. Combine avocado and next four ingredients. Squeeze lime over chicken before serving. Top with avocado mixture.